How in the World Do I Increase Employee Productivity? It’s holiday time as I write this and countless employees across various industries have told me they aren’t in the mood to work. Sound familiar? Even if your employees haven’t been so brash as to tell you this, it’s likely their struggling. And if they’re struggling, your business is too. But you don’t want to come off as Ebenezer Scrooge! So how do you get your employees more focused and productive without alienating them and decreasing morale? It takes a balance but these productivity and motivation tips can get you through the holidays and all the other times as well. First, decide what it is that your team and culture are lacking. Are they meeting customer needs or exceeding them? Are they adhering to their job description but not doing anything that is wowing you? Is it an individual or the whole team that needs help? Understanding the source and the depth of the productivity/motivation issue is essential to curing it. For instance, if it’s one person and nothing you try is changing it, the solution may be as simple as switching out that person. However, if it’s an entire team, the issue is much deeper than a single hiring situation. Often job expectations can be found in the job description, but not always. If your culture is one that the employee should pitch in to help anyone who needs it, this should be communicated ahead of time. If the customer is always right, this too should be communicated. Whatever expectations you have for the team should be addressed early and often. Knowing what’s expected of them will help them achieve their goals and feel like a valuable part of the team. On the other hand, having certain expectations that they don’t meet because they didn’t know about them, only serves to alienate the employee and bring on feelings of failure. That doesn’t make anyone more productive. A safe, naturally-lit, comfortable, and clean workplace with few distractions is best for productive employees as a general rule. But it also can benefit you to know how your team works best. While studies have shown open workspaces aren’t the key to productivity for most people, especially introverts, they might be perfect for your group if they love brainstorming and creative collaboration. Talk to them and find out how they work best. Also, find out what’s important to them around the office. Sometimes a snack machine can make all the difference. A manager or boss’ job is two-fold, helping with professional development to make them the best employee possible and clearing the obstacles that impede employees from doing their jobs. Doing this will keep discouragement at bay and make them feel like you have their back. People work harder for those they feel protected by. Never ignore a productivity issue believing it will go away. If you think a productivity issue exists because one of your employees is dealing with a personal problem, take the time to speak with them about it and find out if there’s anything you can do. In some cases, they may be eligible for leave while they straighten things out. While that’s not ideal, it’s better than having someone at your business who is bringing others down because of their lack of productivity and what others assume is you not addressing it. If it’s seasonal, it still must be dealt with. Every day that you have an uninspired employee working for you is one more day a customer sees that lack of motivation as a reflection on you and your company. You can’t afford an off day so make sure everyone understands the importance of their role and how they fit in. This can be very inspiring. On the other hand, if it’s not a personal problem but rather a bad attitude, you need to address it quickly before it begins to bring others down too. Don’t assume it will rectify itself. After all, misery loves company. Don’t assume what you love is what they will love. If you’re rewarding someone for doing something amazing, find out what means the most to them. Some love cash, while others want a day off. Whatever they prefer, make sure you also recognize them in public. Yes, some people find this embarrassing but it’s necessary so that everyone knows why they are being singled out. It sets an example for the team. 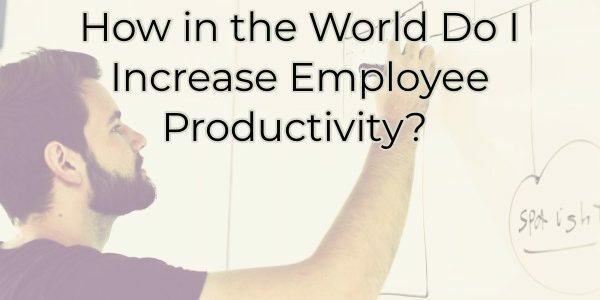 If you’re struggling with employee productivity, it’s time to take action. Get to the bottom of the issues, clear the path to doing their job, and deal with issues decisively. When employees trust youo take care of matters, they will respond with more interest and desire to do a great job.